It doesn’t get much more intimate than the litle 70-seat studio space two flights down from street level at the Leicester Square Theatre. Come in late and you risk running straight into the back of Iago, who will break off briefly from what he’s doing and show you to your seat with disturbing courtesy. With a stage surrounded by spectators as close as a garment, this is a regular crucible for comedy evenings. Not tonight however, as Shakespeare’s relentless investigation of the green-eyed monster jealousy gets rolling. This is SitTrag. The nearness of us to them and vice versa is apt enough since the play, despite the soldierly standing of its principals, is as intensely domestic as Shakespeare gets, and yes, that is saying a great deal. The politics are almost exclusively emotional, and the field of conflict is the bedroom. The question, as ever with this one, is how to read the title role. Lord knows, the world and his wife have tried, and handed the plum to everyone from Olivier to Hopkins on the white side, and Paul Robeson to Lenny Henry on the black. Some have gone with the critic A.C. Bradley’s view of him as the ultimate romantic while any number of post-Freudians have sensed some possession, demonic or otherwise, at the heart of this historic outsider. The Grassroots Shakespeare Company have sensibly spared us all a black-up and cast Nari Blair-Mangat, whose fledgling career includes roles for the Young Vic, The Donmar and Kenneth Branagh’s production of Macbeth. Physically, he’s a more-ish kind of Moor, splendid of torso if incongruously London RP of voice. Given that he’s way down the role’s declamatory spectrum, it makes the linked question of Iago even more important. True, Shakespeare’s machine of dire treachery and lamentable susceptibility is so powerful as to be self-driven; and yet, we have an absolute requirement to see how this poisoned friendship evolves into its ghastly travesty of romance, with the slighted underling luring his master into the joint enterprise of exposing the saintly Desdemona as an adulteress. This, as much as any other element, is the business in play. It makes their chemistry, or rather alchemy, crucial. 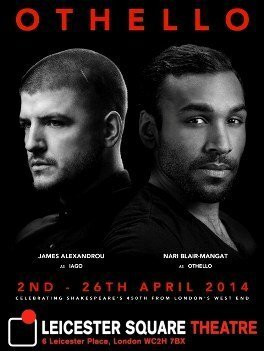 Well, the answer is James Alexandrou (Romeo at the Globe; Orlando and Pistol for the British Shakespeare Company). He and Grassroots founding director Siobhan Daly have gone for the insidious confidant. Using the ear of the front rows beneath his nose, he lets us in on his stark motivation “I hate the Moor,” and his intention of destroying the man’s life. Who is he reminding us of? An earlier anti-hero, similarly given to villainous showboating: Richard III in his Duke of Gloucester phase. It’s a risk. As the nasty stratagem unfolds, here’s an Iago who seems to be passing himself off as a sort of boyish scapegrace, a Just William of Marriage Wrecking. Any more and it could be, God help us, sweet. It’s Shakespeare who saves this interpretation from the (sometimes overlooked) perils of underplaying; him and a woman. Not so much Desdemona this time as Emilia, Iago’s slow-fused but devastating explosion of a wife. When Emily Jane Kerr (whose Grassroots credits include Puck and The Tempest’s Stephano) shops her man in the play’s climax of constructive disloyalty, she does so with a fearsome naturalism. It stops us in our tracks, reminds us that the stuff we’ve been watching is of desperate importance, and salvages a morality play from this great, unsparing tragedy.